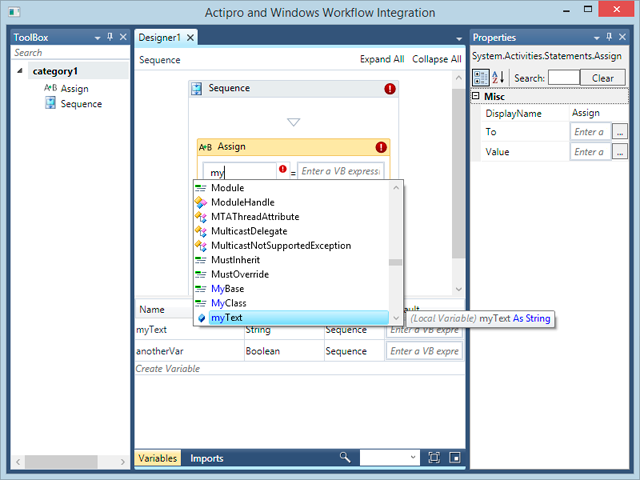 A couple weeks ago we posted a blog entry showing off a sample we created, where a hosted Windows Workflow Designer instance is integrated with our WPF Docking/MDI and SyntaxEditor controls to dramatically improve the designer UI. Since that post, we've had a number of customers request the sample that we created, and we have been happy to pass it along. In today's post, I wanted to announce that we've updated the sample yet some more, adding automated variable IntelliPrompt features! In the screenshot above, two variables are declared: myText (a string) and anotherVar (a boolean). I pressed Ctrl+Space in the expression editor (a SyntaxEditor control) to display the completion list. The myText variable shows up properly as a string. Next, I moved to the assignment expression (another SyntaxEditor control) and typed anotherVar. to get the members of that variable. SyntaxEditor's .NET Languages Add-on kicks in again here and shows the members appropriate for a boolean value. These sorts of features really improve the editing experience for your customers. If you rehost the Windows Workflow Designer in your WPF apps and would like our example, please contact us and we'll pass it along. For those customers who downloaded the first version, this update (along with some other tweaks) is at the same URL as before.